On Apr 29, 1836, the infant Society of Mary received official approbation from the Church through a letter from the mission-minded Pope Gregory XVI. Marists today offer Mass for God's blessing on the Society of Mary. Click to download Votive Mass or Paraliturgy remembering St Peter Chanel and his martyrdom on the Pacific island of Futuna on Apr 28, 1841. 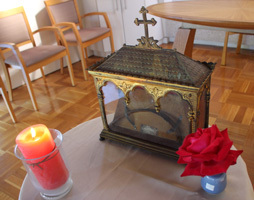 Below: Relic of St Peter Chanel in the chapel of Montbel, Hunters Hill | St Peter Chanel chapel in the grounds of Villa Maria monastery. 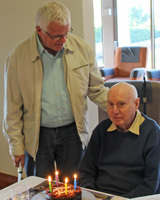 Senior member of the Society of Mary's Australian Province, Brother Colin Campbell SM, turned 95 on Apr 27. 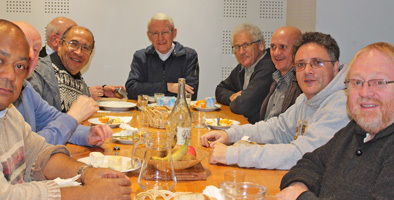 Confrères of the Montbel retirement community joined Br Colin at a simple luncheon celebration, far cry from conditions in wartime Bougainville behind enemy lines, says the World War II veteran. It was announced on Apr 25 that three members of the 'Bridge Program' are among the forty young Burmese selected by Australian Catholic University for their online program in Maesot, Thailand, from a total of almost three hundred applicants..
Hearty congratulations to Hay Mamn Oo and Thoo Lei Soe (both BP2016) and Thae Thae Khu (BP2016-17). Graduates of the 'Bridge Program' for 2016 and 2016-17 met recently in the Thai-Burma border town of Maesot, Thailand, to celebrate the end of their course. Australian 'BP Friends' made the celebration possible as well as sending some party cash to BP-ers in the refugee camps of Mae La and Umphiem. The Bridge Program prepares Burmese youth for further studies including access to tertiary programs with Australian Catholic University. 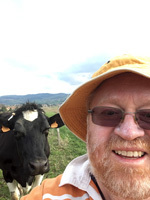 Marist author and spiritual writer, Fr Paul Glynn SM, left for New Zealand on Apr 21 for this year's Eucharistic Convention to be held in Auckland over the Divine Mercy weekend. Fr Paul will spend much of the convention time making the Sacrament of Reconciliation available to participants, encouraged, as he says, by Pope Francis' invitation to celebrate this sacrament well and in the spirit of the Divine Mercy devotion. Marists worldwide invite you to join in prayer for vocations through the intercession of their first martyr and Saint, Peter Chanel. 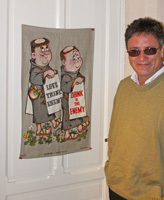 Fr Gerard Hall's paraliturgy can be used on the feast day, Apr 28. ACU's written tests at Umphiem refugee camp, Thailand, with blue-shirted BP-ers, Pyae Pyae / ... and Sai Sai. 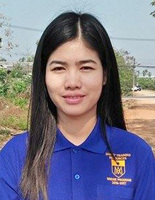 Following recent entrance tests in Thailand, participants in two 'Bridge Programs' are awaiting word from Australian Catholic University about the next intake for its online diploma course. 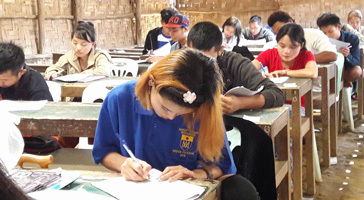 Graduates from BP16 and BP16-17 were amongst the hundreds of young Burmese sitting for the written tests at Maesot and the refugee camps of Umphiem and Mae La on the Thai-Burma border. 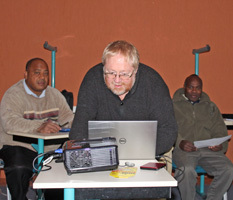 Several were numbered among the fifty-six invited to the interview stage. They are now awaiting ACU's final word. We wish them success. Below, from left: Hopeful BP-ers, King Shee, Thae Thae and Hay Mamn, with ACU staffer and former BP-er, Saya George, at Mae Pa, Thailand / ... Pyae Pyae, Kloh Wah, Thu Mu Say and Sai Sai with Saya George at Umphiem refugee camp | Blue-shirted BP-ers, Paing Paing, King Shee, Kyaw Zin, John Khai, Thae Thae and Hay Mamn, at Mae Pa with former BP-ers now studying at ACU | BP-er, Thoo Lei, at Mae La Camp, with former BP-ers and ACU graduates, Naw Eh and Saya George. 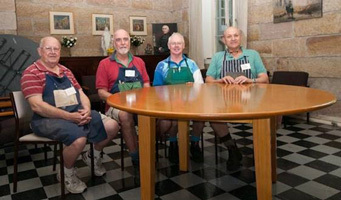 The Marist community of Villa Maria monastery, Hunters Hill, has a set of new tables, crafted by members of the nearby Men's Shed. Opened in the monastery grounds five years ago, the Shed attracts local men on Mondays and Wednesdays, producing a range of handicrafts -- including attractive, round tables for monastery use. 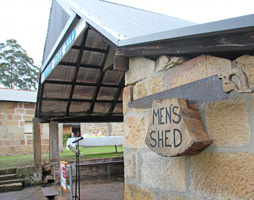 Thank you, Men's Shed! 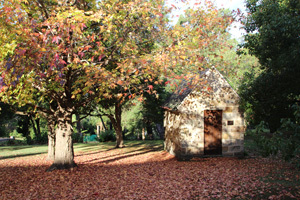 "The blossoms are emerging, the flowers are blooming and the grass is very green. Spring has come and winter is over. "Since the Colinian Program of Renewal began on Ash Wednesday we have spent time getting to know La Neylière, each other, France, and the local area. Fr Tony continues: "Then Fr Larry Duffy and Deirdre McDermott from Ireland gave some input on Applied Spiritual Theology as seen through the lives of Teresa of Avila and John of the Cross. 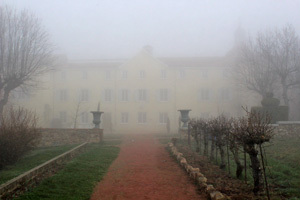 "On Sunday 26th March the group began its first silent directed retreat which will finish on Wednesday 5th April. Who is Jean-Claude Colin for me? 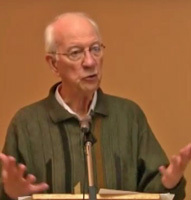 SM Bulletin (Rome) reports: "At the request of the Superior General Fr Gaston Lessard SM from the province of Canada has written a booklet on Fr Colin. 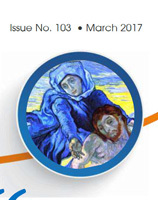 "The booklet is now being printed in English, French and Spanish and will be distributed to all Marists before Easter." 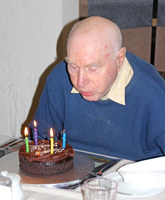 Fr Gaston writes: "Jean-Claude Colin has been my companion for the last sixty years. I single out three moments in this long fellowship. The first is the summer of 1956, which I spent with Jean Coste as we visited the places where Colin had lived. The second came soon after: I spent two years indexing the Mayet Memoirs. The third came much later and lasted longer: it is the time I spent editing the letters that Colin wrote until the end of his life." For our number-lovers: comparative figures for visits to this web site during the first quarters of 2016 and 2017. 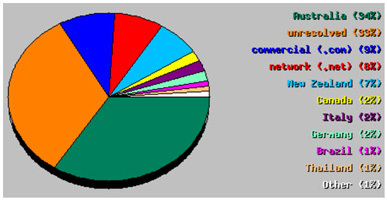 Daily visits are up 20%, and 'hits', 'files opened' and web traffic almost doubled. Visitors seem to be lingering longer.